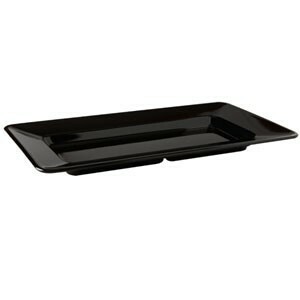 An excellent option for restaurants, catered events, and other types of functions, the GET Enterprises ML-10-BK Milano Black Rectangular Plate 15" x 8" is an attractive and durable dinnerware piece. Boasting a sleek black finish, this plate beautifully highlights the colors and textures of food. As attractive as it is durable, this ceramic-looking melamine plate is non-toxic and resistant to heat and breakage. For added convenience, this NSF approved rectangular plate is commercial dishwasher safe for quick cleanup.